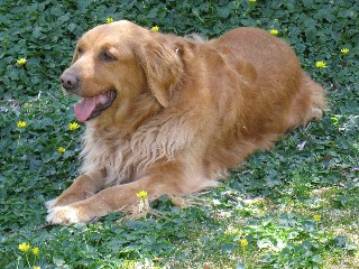 After losing our golden retriever Shasta to cancer we decided to get a rescue dog from LIGRR. Our goal was to adopt a nice young, healthy dog. Three months ago we adopted Eclipse. She was an older dog (7) and had cancer. Let me put it this way. The match was perfect! We could not ask for a more wonderful animal. She was diagnosed with a benign, but invasive cancer in her mouth and had to undergo surgery which involved removing a fairly large section of her jaw. The surgery was done by the top surgeon at The Westbury Center for Specialized Veterinary Medicine. We even spent the night with her at their Compassionate Care Center with Eclipse. LIGRR paid for the surgery. We and Eclipse will be forever grateful! She was the ideal patient, and taking care of her in her time of need was a privilege. My wife, mother, and I work as Hospice volunteers. I work with patients and there was something about Eclipse that told me she would be great with them. After having her only one week I took her to meet a patient. She went right up to him and licked him. This from a dog that is not a "licker." She has no interest in toys, balls, etc., just being with people. She just lay down by the patient&apos; side and stayed there. When I make visits, I now realize that I&apos;m merely the chauffeur. It&apos;s Eclipse that is the real hospice volunteer. 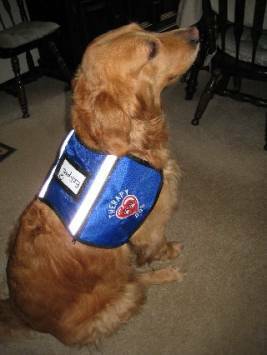 She has become the official Hospice therapy dog. My mother wound up in the hospital recently and then in a rehab place. The dog has been spending a few hours a day at these places, and is loved by all. It takes me an hour to get to my mother&apos; room. There are so many residents that look forward to seeing her every day. Sensing her perfect therapy dog temperament (loves everyone, never barks, eager to please, etc.) I decided to train her to take a therapy dog test. Who says you can&apos;t teach an old dog new tricks? I figured that we would be ready in a few months. An opening in the testing schedule allowed her to take the exam a couple of weeks ago. I figured it was worth a shot, and would be a good way for me to evaluate her progress. I am proud to say that she passed the test with flying colors, and is now an official therapy dog with Therapy Dogs International, the premier certifying group. And this, after only being with us for less than three months, and undergoing major surgery and a long recovery period. What a girl! When we picked up Eclipse the first day Melanie (President of LIGRR) asked my wife what she thought of the dog. My wife simply said, "Wonderful." On the comment section of the therapy dog test the evaluator wrote a single word, "Wonderful." My wife and I would like to thank LIGRR and Melanie in particular for letting us adopt Eclipse, and for taking care of her surgery. She never leaves our side. 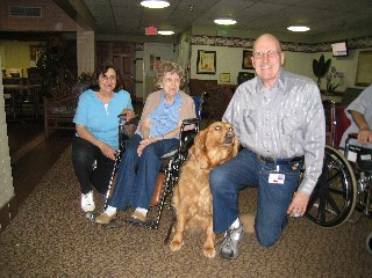 She is simply a joy to us and her many, many friends that she has interacted with at Hospice, the hospital, the therapy/nursing home, and everywhere else she goes. 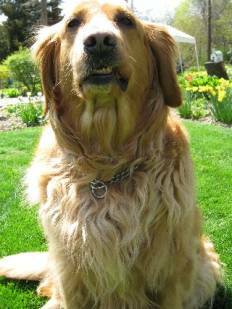 We would also like to let people know that they should not shy away from an older golden. While it&apos;s hard to think that we missed seven years of her life, we are just so thankful that we will be allowed to share the rest of her life with her. Our original application asked for young, healthy dog. While there is nothing wrong with one of those, believe me when I say that an "Oldie Goldie" is something everyone should consider. We are so very pleased that we did. We keep trying to find the words that describe LIGRR and Melanie for teaming us up with Eclipse. Perhaps a single word says it all, "Wonderful."